In San Francisco's Chinatown, an Arizona mine owner named Manning visits a curio shop owned by Wong Fai, seeking help from Charlie Chan because he believes that someone is out to kill him. While in the shop, Manning is shot at by an unseen assailant. Later, Chan agrees to help Manning. Accompanied by number two son Tommy and chauffeur Birmingham Brown, Chan poses as a tourist and checks into the Lazy Y Dude Ranch which is located near to Manning's "Golden Eye" mine. After his arrival, Chan is met by San Francisco police lieutenant Mike Ruark who is working undercover for the government. Ruark is there to investigate large amounts of gold ore that are suddenly flooding the market, and after sharing information, he and Chan realize that the matters that each of them are working on are probably related. Ruark informs Chan that Manning has been badly injured in a mysterious fall in his mine, he also fills the detective in on how Manning's mine is suddenly producing so much gold that it is now one of the country's richest. Posing as a dealer in oriental curios, Chan goes to the Manning home, where he meets Manning's daughter Evelyn, mine superintendent Driscoll and his wife, and the local assayer Talbot Bartlett. Chan is also allowed to visit Manning who is unconscious with his head completely wrapped in bandages. Returning to the dude ranch, Chan finds assayer Talbot Bartlett, who, years ago, had played on the same high school baseball team in Honolulu as the detective's number one son. Bartlett tells Chan that he has been assaying some of the gold coming from the Golden Eye mine. Evelyn Manning, unaware of the mine's recent tremendous productivity, tells Bartlett that the nursing sister, Sister Teresa, whom Driscoll has hired from the nearby mission, is strange, and uncommunicative. Later, back at the dude ranch, Lt. Ruark tells Chan that Driscoll has a criminal record. Chan also discovers that Manning's nurse is a fake. Chan later finds that Driscoll has been smuggling gold out of Mexico, where the price of gold is much less than in the United States, and selling it at a much higher price north of the border. With his scheme at stake, Driscoll wants Manning and everyone else out of the way so that his illegal operation can continue. When Chan, Tommy, and Birmingham return to the mine, Birmingham stumbles upon another body that turns out to be Manning. They all return to the Manning house where the detective begins to remove the bandages from the patient's head. The patient suddenly begins to scream, and Sister Teresa rushes in, gun drawn, just as Chan reveals the patient to be Mrs. Driscoll. After Evelyn struggles with and subdues Teresa, has to break the news to her that her father is dead. Driscoll then enters the room and draws his gun, but Tommy outsmarts him from behind, pretending that he has a gun. Tommy then tells his father that he has received a telephone call from the Mexican police, informing him that they have stopped the next shipment of gold at the border. Driscoll tries to escape, but he is shot dead by Bartlett, who is captured by Chan and revealed as the real brains behind the entire gold smuggling operation. NOTES: The working title of this film was The Mystery of the Golden Eye. The opening title card reads: Charlie Chan in "The Golden Eye". The Call Bureau Cast Service lists Herman Cantor and Sam McDaniel in the cast, but they do not appear in the finished film that we have available today. Copyright records list George L. Spaulding as Dr. Groves, but the role was played by Sam Flint. Richard Loo, Barbara Jean Wong, and Tom Tyler are also listed in the cast, but they do not appear in the finished film. People who listen at keyholes rarely hear good of themselves. So much for so much. Small things sometimes tell very large stories. Too much familiarity breed carelessness. Small investigation sometimes brings large amount of knowledge. Little knowledge sometimes very dangerous thing. Willingness to speak not necessarily mean willingness to act. Little knowledge sometimes very dangerous possession. Deer should not toy with tiger. (Lt. Ruark: "Two heads are better than one, you know.") Sometimes debatable point. "The Golden Eye," another Charlie Chan meller, is hardly up to the standard of the series. Roland Winters is not particularly exciting or realistic as the new Charlie Chan. But the plot and direction also to be at fault. Film is of quickie calibre, strictly for padding out the dualers. Chan's operations this time take him to a dude ranch and a gold mine in Arizona. Plot is of a supposedly mined-out shaft that suddenly becomes active. The secret ultimately is revealed of how the ore was actually smuggled from Mexico, then sold in the U.S. at an exorbitant price. Winters is too listless as Chan although he's not helped much by the yarn. Victor Sen Young is acceptable as the detective's ambitious son. Mantan Moreland, as the chauffeur, provides a few humorous moments, but milks each situation too long. Tim Ryan does well as a police lieutenant. William Beaudine's direction is passable. ACCORDING TO WONG FAI, CHARLIE CHAN'S PRESENT LOCATION: "Chan, at present time, at Chan family on Washington Street, where he bring New Year's greeting to honorable cousin." ACCORDING TO CHARLIE CHAN, THE TYPE OF GUN THAT WAS USED IN THE ATTEMPTED MURDER OF MR. MANNING: "German Mannlicher..."
ACCORDING TO MR. MANNING, THE LOCATION OF THE LAZY Y DUDE RANCH: "...only a half mile from my property." THE NAME OF THE SONG PARTIALLY SUNG BY BIRMINGHAM BROWN AS HE PACKED HIS SUITCASE: "Home on the Range"
ACCORDING TO CHARLIE CHAN, HIS QUARTERS AT THE LAZY Y DUDE RANCH: "...bungalow number 9..."
THE NAME OF THE SONG PARTIALLY SUNG BY LT. RUARK WHILE FEINING DRUNKENESS ON HIS WAY TO CHARLIE CHAN'S BUNGALOW: "Bury Me Not On The Lone Prairie"
ACCORDING TO CHARLIE CHAN, THE LENGTH OF TIME SINCE THE ATTEMPTED MURDER OF MR. MANNING IN CHINATOWN: "...two days ago..."
ACCORDING TO LT. RUARK, THE CAUSE AND EXTENT OF THE INJURIES SUFFERED BY MR. MANNING IN HIS SUSPICIOUS ACCIDENT IN THE GOLDEN EYE MINE: "Fell down one of the shafts in the mine. Badly bruised head and shoulders and a possible skull fracture." 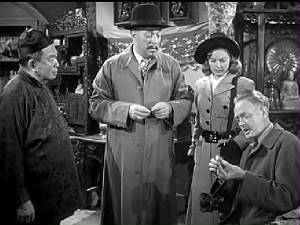 CHARLIE CHAN'S UNDERCOVER IDENTITY ACCORDING TO HIMSELF: "...Chan, dealer in Oriental curios." CHARLIE CHAN'S "DELIVERY" FOR MR. MANNING: "...some objects of jade..."
DOCTOR GROVE'S DESCRIPTION TO CHARLIE CHAN REGARDING MR. MANNING'S INJURIES: "Multiple contusions about the head and shoulders. It's impossible to tell just how bad without x-rays." ACCORDING TO DR. GROVE, THE HEIGHT FROM WHICH MR. MANNING FELL INSIDE THE GOLDEN EYE MINE: "...about forty feet." ACCORDING TO JIM DRISCOLL, THE ARRANGEMENTS MADE FOR THE CARE OF THE INJURED MR. MANNING: "...I've arranged for a nursing sister from the mission school." DR. GROVE'S PAIN PRESCRIPTION FOR MR. MANNING: "Mr. Manning will need to have opiates for several days as soon as he recovers consciousness." ACCORDING TO TALBOT BARTLETT, HIS FORMER PROFESSION IN HONOLULU: "...collector of customs..."
ACCORDING TO CHARLIE CHAN, TALBOT BARTLETT'S SPORTS ACTIVITY IN HONOLULU: "...excellent first baseman who play with number one son on high school baseball team." TALBOT BARLET'S "NAME" FOR THAT RESTAURANT: "Ptomaine Louie"
TALBOT BARTLETT'S ASSAY ASSESSMENT ON THE ORE THAT PETE HAD BROUGHT IN: "Won't bring in more than six dollars a ton." ACCORDING TO PETE, THE LOCATION OF HIS SHACK: "...at the bottom of Hay Canyon." ACCORDING TO CHARLIE CHAN, THE DIFFERENCE IN GOLD PRICES BETWEEN MEXICO AND THE UNITED STATES: "Gold worth seven dollars ounce in Mexico worth thirty-five dollars ounce in United States." assayer - One who examines metallic ores or compounds, for the purpose of determining the amount of any particular metal in the same, especially of gold or silver. Jim Driscoll: "Mr. Bartlett, the local assayer." bonanza - (1) A rich mine, vein, or pocket of ore. (2) A source of great wealth or prosperity. Lt. Mike Ruark: "...the way the gold was flowing into San Francisco, it's a bonanza." German Mannlicher - The Mannlicher M1895 rifle was originally adopted and employed by the Austro-Hungarian Army throughout World War I. A number of these rifles also saw use in World War II, particularly by second line, reservist, and partisan units in Romania, Yugoslavia, Italy, and to lesser degree, Germany. Following the war, many were sold as cheap surplus, with many being exported to the United States as sporting and collectible firearms. Charlie Chan: German Mannlicher bullet. Many of these guns now available in country since recent unpleasantness with Mr. Hitler." opiates - (1) Any of various sedative narcotics containing opium or one or more of its natural or synthetic derivatives. (2) Drugs, hormones, or other chemical substances having sedative or narcotic effects similar to those containing opium or its derivatives: a natural brain opiate. (3) Things that dull the senses and induce relaxation or torpor. Dr. Grove: "Mr. Manning will need to have opiates for several days as soon as he recovers consciousness." Jim Driscoll: "You're not going to pin all this on me, Chan!" Prohibition Party - A minor U.S. political party organized in 1869 that advocated prohibition. Charlie Chan: "At first, think Lieutenant Mike are giving Prohibition Party kick in teeth." ptomaine - A term for food poisoning that is no longer in scientific use; food poisoning was once thought to be caused by ingesting ptomaines. Talbot Bartlett: "Yeah, 'Ptomaine Louie's.'" tetanus - An acute, often fatal disease characterized by spasmodic contraction of voluntary muscles, especially those of the neck and jaw, and caused by the toxin of the bacillus Clostridium tetani, which typically infects the body through a deep wound. Also called lockjaw. Charlie Chan: "Possibly you were anticipating tetanus?"